On the list of real estate dreams, owning a waterfront home on an ocean beach often ranks at the top. To many, the beachy lifestyle can seem like a distant goal when terms like oceanfront and affordable rarely appear together. Buying a waterfront home may not have to be the expensive proposition you imagine, as there are bargains to be found. Yes, you can find a home that offers sandy waterfronts, plenty of enjoyable water-based activities, plus bargain-priced housing, and ocean breezes to add to the enjoyment and relaxation. A simple, waterfront cottage can rent well above the market average and provide a reliable income stream during peak season to help offset expenses making them an even better value while giving the owner access to a delightful vacation spot. Having the ability to wake up and hear the water lapping against the shore, the smell of the sea salt air, and tranquility make beachfront property the ideal choice for many buyers. Many of the waterfront homes you find in this group are older cottages with beachstone fireplaces possibly only for three-season use and bring with them the “Summer of ‘42” experience. Current zoning and conservation issues might not allow new homes to be built with proximity to water that you may find in older cottages. 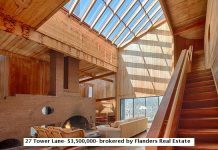 Do not expect a large newer home with luxury gourmet kitchens, high ceilings and large central common room. It is all about the view and how it all feels. Homes will be smaller, older and charming with views that go on forever and your own private waterfront. Many will be surrounded or have easy access to miles and miles of hiking through conservation land and water access for swimming, paddling or just watching the sun as it follows its morning and evening ritual. 15 Doctors Creek Path in Chilmark is an example of a “one of a kind” south shore location not often available for purchase. The property features 180 degree water views over Chilmark Pond, to the barrier beach and beyond. Looking westerly over the Atlantic to Noman’s Land are views that truly go forever and oh those sunsets. The cottage is a seasonal, cozy camp with beach stone fireplace and a short walk to the shores of Chilmark Pond and across to your private South beach access. You can use the property as is to enjoy all that waterfront living has to offer or update to your own specs for luxury living. 33 Beach Road in Oak Bluffs is another seasonal property and another one of a kind with a deepwater dock. The home’s history includes being originally known as Station #7 of the NY Yacht Club, a place to stop and relax while sailing the Vineyard waters. The views are from Vineyard Haven harbor and across Vineyard Sound to the Cape with its flow of sailboats. The 4 bedroom cottage has a magnificent, original floor to ceiling stone fireplace and an updated kitchen. The home is set behind a wisteria covered privacy fence and has a bonus feature of a converted porch to watch the sunsets on cooler nights. 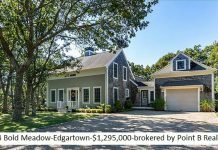 10 Fowler Lane in Edgartown provides the experience of a waterfront cottage (well, actually 2) restored to retain their charm and simple carefree style. 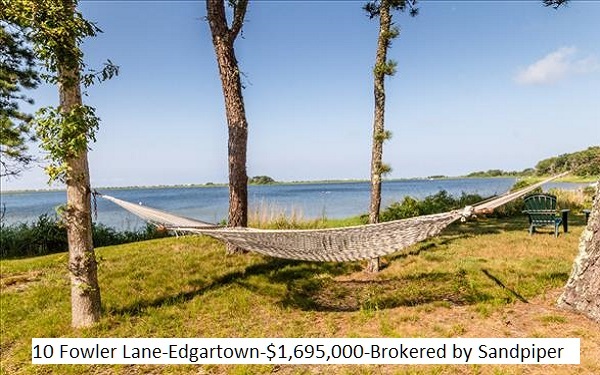 Long term, the best value for a luxury waterfront home in Edgartown probably in years. Named Wind’s Will, you will awaken to the sun rising over Nantucket Sound and fall asleep to the water lapping at the shore of Sengy. Fishing, clamming, kayaking, paddleboarding and swimming are all at your doorstep with a 95’ private sandy beach and your own mooring. And, of course, one beautiful stone fireplace. Sarita Walker Road might not fit this category on its own especially if you purchase it with its neighboring property that does contain a small cottage but adds the benefit of a swimming pool close to the water edge. The combination of the 2 properties would be the starting point for an incomparable family compound for generations to come. The open land is 4.6 acres on the shores of Watcha Pond with views out to the barrier beach and Atlantic Ocean beyond. The property and all the surrounding land was home to the Coffins families Scrubby Neck Farm and remains in a pristine state with hundreds of acres of wild grassland. Click here for a complete list of waterfront homes under $2M.